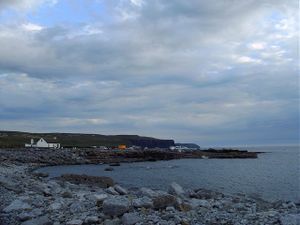 A recent Aisling trip to Ireland visited that hotspot for traditional Irish music, Doolin, in County Clare. Here Aisling worker Alex McDonnell give the run-down on the trials, tribulations, and sucesses of the trip. I have known Sean for over 12 years. When I first arrived at Arlington House he was one of the Irish residents who kept a low profile in the house but nevertheless had the respect of the other Irish men. He liked a drink but kept it in moderation. Like the other men, he could no longer afford to drink in pubs and drank cans but he never drank the super strength stuff and the lads that did drink it seemed to admire him for his comparative sobriety while at the same time denying that the blue cans were in anyway harmful to themselves personally. ‘That Sean, he’s a regimental man, you’d never see him falling around the place; ‘Sean wouldn’t thank you for one of these blue cans at all’; ‘Sean is always suited and booted, proper respect’. But Sean where are you going to get £2,000 from?’ I would say. ‘I don’t know but there’s no way I can go back without money in my pocket’. ‘Then you are saying you won’t ever go back because you’ll never save that kind of money’. ‘Well that’s the way it will have to be then’, he would say. Over the last couple of years Sean had kept saying he would go with Aisling but always pulled out at the last minute. This year I had a bit of a strategy, I made sure I had time to spare and that the other men going on the trip to Clare from Arlington were friends of Sean’s. They were ready early and I knocked on Sean’s door. Sean was sitting in his neat little room watching the racing on the telly. ‘I’m not going. I can’t just drop everything… I need some notice’. ‘You told me a couple of weeks ago that you were definitely going this time’. ‘Of course I got your letters, I always get your letters’. ‘I’m not going and that’s that. Thanks for everything and I appreciate it, but I can’t go…’ And so it went on for an hour until I nagged him into it. On the way he kept marvelling at how here he was, on the bus. He had never had any intention of going and yet here he was. His mate Jim was with him and he had been there himself and knew what Sean was going through, but as I looked back in the rear view mirror I could see Sean shaking his head in disbelief every now and then. The Cricklewood Homeless Concern centre is closed for renovation. In fact, it has been pulled down and they will be rebuilding over the next year. So, this trip we picked up from Arlington House Hostel, the London Irish Centre and the Catholic Church in Quex Road, Kilburn. This year we were determined to have enough drivers and had recruited volunteers early on so that we had 2 drivers in each minibus for the long journey to Clare. A couple of weeks before the trip however people started to drop out. All had very good reasons but it left us with a problem and we had to ring around people we knew to find replacements who not only could drive a minibus but also people who knew the clients or at least had worked with similarly vulnerable people. In the end we managed to get enough drivers for the journey over and others to fly out for the journey back and others filling in during the week. Amazingly it all worked out fine in the end but not without some fraught moments. If anyone is reading this, can drive and would like to help out… please get in touch. If anyone is reading this, can drive and would like to help out… please get in touch. Several of our lads could testify to that and they made friends from all around the world who had come to Doolin to find the authentic Ireland. I just hope it doesn’t become too much of a theme park although it is still relatively unspoilt and I could see no signs of Bunratty-style blarney in the place. It was a treat to meet people from so many corners of the world, indeed we even met folks from London. Bus Eireann has recognised the potential of trade in the area and runs several buses in all directions to the major centres of Ireland from a bus stop opposite the back-packers hostel down the narrow stone walled lanes. We managed to settle in very quickly. We had three woman clients with us and Charlie was there to look after the womens’ house but also was very busy working with the others as they all had various health problems which she kept an eye on, especially after the long journey. Maureen is over 80 and was pretty stiff after the time in the minibus and, although we had plenty of stops for refreshment and just to stretch our legs, it took a day or so for us all to recover fully. Maureen wanted to be part of everything and was interested in everything that was going on around her. We passed through Tipperary town where she was born and lived with her parents until they died when she was three years old and she had a picture in her mind of the town and was amazed at the changes to the shops fronts etc. although the same buildings were still there. Also as we drove through Limerick, where she had lived in a home with her sisters, she looked out of the van at the city in wonder, never having seen it for 60 years. Maureen is living in a hostel in London and is desperate to find her sister..
Maureen is living in a hostel in London and is desperate to find her sister but there are very few clues as to where she might be if she is still alive. She has so few mementos: a previous hostel she stayed in threw out all her personal belongings while she was in hospital including the few pictures she had of her family. Could anyone with an ounce of empathy do such a thing and should you work with vulnerable people if you have no empathy? Maureen though is cheerful and enjoys the company immensely and after a couple of days into the trip she was planning to come back again. Peter, our regular van cleaner and general man about the house was staying with his cousins in Wicklow for the week before our arrival. Earlier in the year Peter had met up with them for the first time. He has been trying to make some connection with his family for the whole of his life and happily has discovered relations that want him to be part of their family. After we settled everyone into the holiday homes on the day we arrived I went out to pick Peter up at Ennis railway station. As I arrived a little bit late I found Peter chatting with the local taxi drivers. Peter sometimes gets his words mixed up and when I asked him what he was talking to the taxi men about he said he was asking them what the fare was, ‘from Ernest to Dougal’. It seems they knew what he meant and the fare was euro50. Not bad. As soon as we got back to the cottages Peter had his sleeves rolled up and was cleaning out the three minibuses. While I was in Ennis that afternoon Steve took a group out to see the Cliffs of Moher which are about 5 miles from Doolin. It is such a busy tourist attraction now that they are building a new visitors centre and car park which will be landscaped into the hill. In the meantime the car park and gift shop have been moved to the other side of the road. The way up to the actual cliffs is now so far from the car park that only a few from our group were able to make it to the cliffs. It is also well protected and screened from visitors so that the days of leaning into the wind over the cliffs or even crawling to the edge are over. Clare is full of wonderful natural attractions and during the week we were taken on a guided tour of the Burren by Helen, a friend from the Novas-Ireland hostel in Limerick and we got to visit the county’s latest attraction which is the Doolin Stalactite.